July in most parts of the United States is hot hot hot, and my thoughts turn once more to sea shells, pearls, amber, wood, and other organic materials. It happens each year at this time...nature-inspired designs and materials start popping into my brain! So, this month, I'll be sharing the work of quite a few artists with you who love using organic and eco-friendly materials in their work. I don't want to leave you out though! The more the merrier! If you would like to have your work featured here, just send me your artist statement of one to two paragraphs, and up to three images (72dpi res) of your work, along with a link to your site and your name as you would like it to appear. Mail it to cyndi @ mazeltovjewelry.com (remove the spaces) and please put "Jewelry Artist" in the subject line. 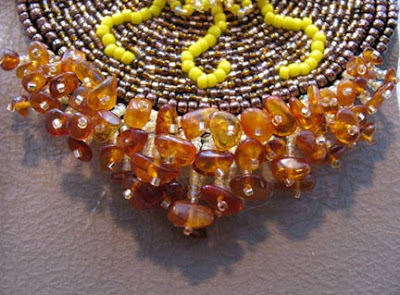 "Organic materials" can include, but is not limited to amber, pearls, wood, nuts, horn, bone, and shells. Let's have some fun this month!